Abigail Pressman would never have guessed that love notes penned on paper hearts by an anonymous couple could restore her belief in love. As a business owner in a quaint town at the base of the Rockies, she's poured everything into dreams of expansion . . . and resisting the matchmaking efforts of the Valentine Volunteers, who gather in her store to continue Loves Park's tradition of stamping mail with the city's romantic postmark.When Abigail is unwillingly drafted into the Volunteers, she encounters the paper hearts, a distraction that couldn't come at a worse time. A hard-to-read doctor has become Abigail's new landlord, and he's threatening to end her lease to expand his practice.As she fights a growing attraction to this handsome man crushing her dreams, Abigail is inspired to string the hearts in her store, sparking a citywide infatuation with the artsy trend. But when a new batch of hearts reaches the Volunteers, it appears something tragic has happened to the couple. Will uncovering their story confirm Abigail's doubts about love, or could it rescue her dreams . . . and her heart? A love story, just in time for Valentine's. The funny thing is that I didn't even intend that when I requested this book. Romance books, especially this time of year, can be hit or miss and I am so happy to say that this one was a hit. While I wasn't able to read it all in one setting, I wanted to and I kept coming back to it every chance that I got. Each of the characters in the book had their own pasts, their own secrets and things that haunted them. This didn't take away from the story at all. Instead, it added to it. On top of that, there were so many wonderful secondary characters and I sincerely hope that some of them get books of their own. I would love to read their backstories and find out what the future holds! 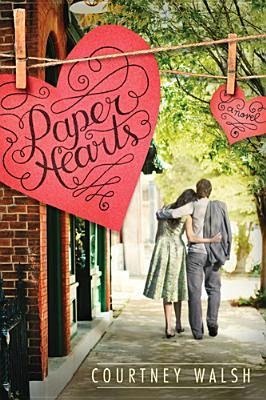 I love the fact that while this is a work of fiction, the paper hearts can serve as a wonderful reminder about honoring and celebrating the love in all of our lives.